If you loved the decade of short skirts and flower power then we have a superb collection for you. In the 1960s love and rock ’n’ roll was the way of life. 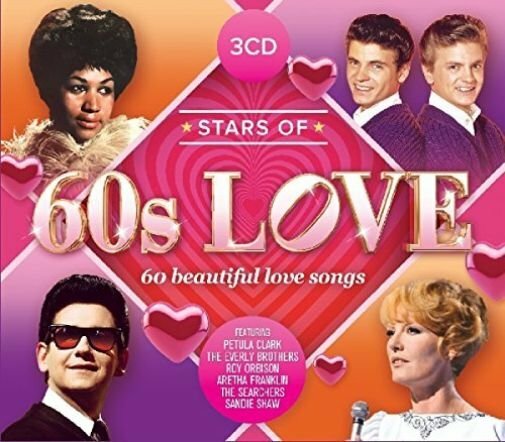 This 3CD brings you 60 international hits that ruled the early 60s, signature love songs that later inspired the unforgettable summer of love. The heartwarming vocals and melodies are provided courtesy of Petula Clark, The Everly Brothers, Roy Orbison, Helen Shapiro, Aretha Franklin, The Searchers and Sandie Shaw to but mention but a few. The timeless gems include Sweets For My Sweet, (There’s) Always Something There To Remind Me, Stand By My Me, When Will I Be Loved, Comin’ Home Baby plus many more.